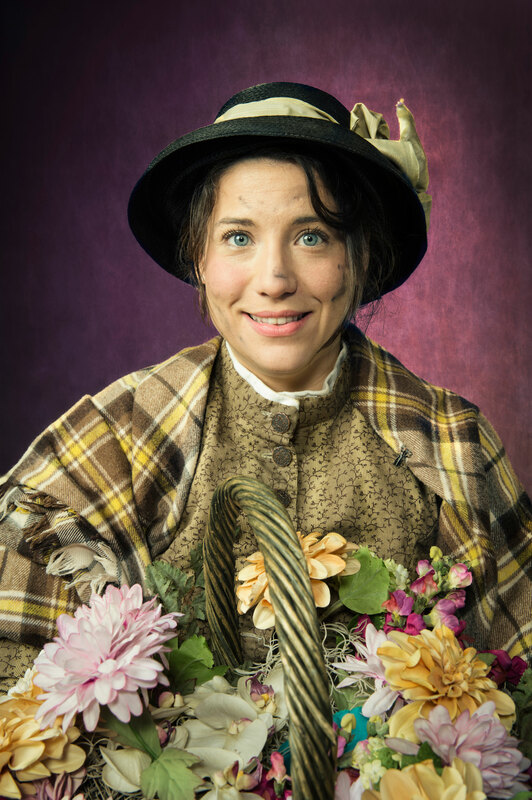 (“Pygmalion” plays at Bruns Amphitheatre in Orinda from July 30 through August 24, 2014). From the opening moments, it is clear that Jonathan Moscone’s staging of Shaw’s masterpiece is extraordinary. The play famously begins in London’s Covent Garden outside the opera house, after a performance. Moscone has made a minor but telling adjustment. In his staging, the opera is not quite over. Eliza Doolittle, one of several street vendors and riff raff, stands outside the theatre listening to the closing aria. She is utterly transfixed. All of her longing for a better life, all of her soul, all of her humanity, plays across her face as she listens. Moscone gives this moment all the time it deserves, and Irene Lucio as Eliza plays it beautifully. It is as effective as a movie closeup. Then, in a rush, the opera ends and the wealthy attendees pour out onto the stage. But they are not living people. Instead, Moscone presents them as cardboard cutouts, each one backed by a bent over member of the lower classes holding them up and pushing them along. This short scene, a kind of prologue, beautifully and brilliantly sums up the argument of the entire drama. It is a directorial tour de force rendered with a fine attention to detail that continues throughout the play. Eliza Doolittle (Irene Lucio), Colonel Pickering (L. Peter Callander), and Professor Henry Higgins (Anthony Fusco) in “Pygmalion” at CalShakes. Photo Credit: Kevin Berne. This production is cast to perfection with some of the Bay Area’s leading talent. Professor Higgins is played by Anthony Fusco, whose credits include thirteen years as an A.C.T. resident artist. His Higgins is complex, seductive, irrascible, irritating, brilliant and charming. L. Peter Callender (Artistic Director of the African American Shakespeare Company and winner of multiple acting awards) is a perfect Colonel Pickering, the kind hearted foil to Higgins’ bluster, but equally befuddled by human relationships. As usual, Callender leaves one wondering if there is anything he can’t play with expertise. James Carpenter as Alfred P. Doolittle. Photo Credit: Jay Yamada. 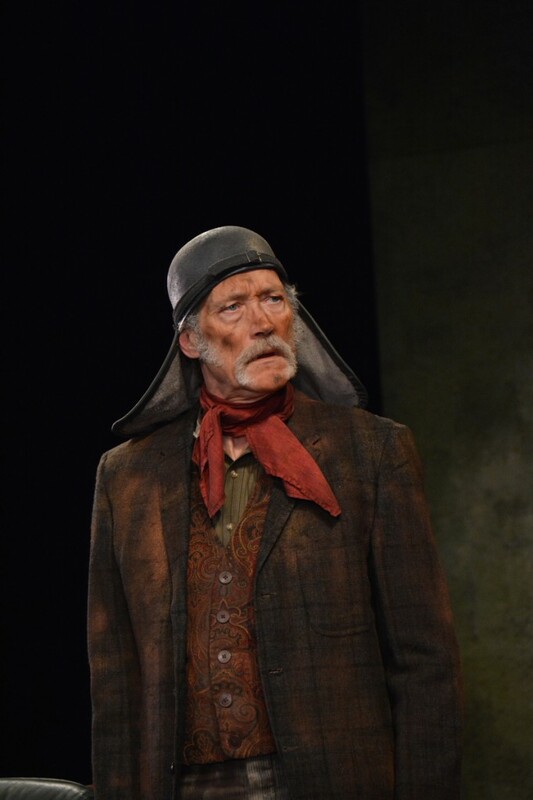 As if that weren’t enough, Cal Shakes Associate Artist James Carpenter offers up a highly original Alfred P. Doolittle. This part is almost always cast by a character-type actor, but Carpenter, with his leading man profile and regal carriage brings something different to the role then is usually apparent. The relatively minor roles of Mrs. Eynsford Hill and her children Clara and Freddy are well played by Julie Eccles, Elyse Price and Nicholas Pelczar, respectively. Catherine Castellanos is dignified and compassionate as Higgins’ housekeeper, Mrs. Pearce, and Sharon Lockwood brings her usual comic finesse to the role of Mrs. Higgins. Irene Lucio. Photo Credit: Backstage.com. Irene Lucio as Eliza Doolittle. Photo Credit: Kevin Berne. As Eliza Doolittle, Irene Lucio makes a brilliant debut at Cal Shakes. From her first appearance, we see both the extent of her degradation from poverty and the depth of her sensitivity. Her gradual development from impoverished flower girl to educated lady is beautifully calibrated by Ms. Lucio from scene to scene, with no sudden jumps. To watch this performance is akin to listening to a great opera singer with an enormous range who can move imperceptibly from register to register. It is a rare kind of precision. This is truly a “Pygmalion” to relish and remember. 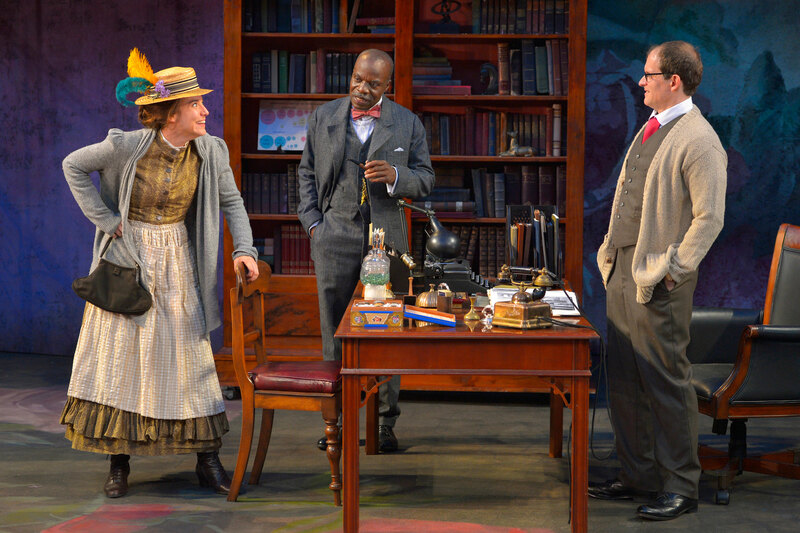 “Pygmalion” by George Bernard Shaw, produced by California Shakespeare Theater, directed by Jonathan Moscone. Set: Annie Smart. Costumes: Anna Oliver. Lighting: Stephen Strawbridge. Sound: Jake Rodriguez. Colonel Pickering: L. Peter Callender. Alfred Doolittle: James Carpenter. Mrs. Pearce/Ensemble: Catherine Castellanos. Mrs. Eynsford Hill: Julie Eccles. Professor Henry Higgins: Anthony Fusco. Mrs. Higgins/Ensemble: Sharon Lockwood. Eliza Doolittle: Irene Lucio. Freddy Eynsford Hill: Nicholas Pelczar. Clara Eynsford Hill: Elyse Price. Parlormade/Ensemble: Ponder Goddard. Ensemble: Liam Callister. Ensemble: Caitlin Evenson. Ensemble: Charles Lewis III. Ensemble: Catherine Luedtke. Posted in Reviews.Tagged Anthony Fusco, California Shakespeare Theater, Catherine Castellanos, Charles Kruger, Elyse Price, George Bernard Shaw, Irene Lucio, James Carpenter, Jonathan Moscone, Julie Eccles, L. Peter Callender, Pygmalion, San Francisco theater reviews, theatrestorm.